Attractive house, 3 bedrooms, 2 bathrooms with shared use of pool and garden. The shabby chic decor of our Guest House is very pleasing. The house itself is semi detached with the main villa where the owners are available for help or any information needed. It is a well appointed self-contained house on two floors with air conditioning and shared swimming pool. 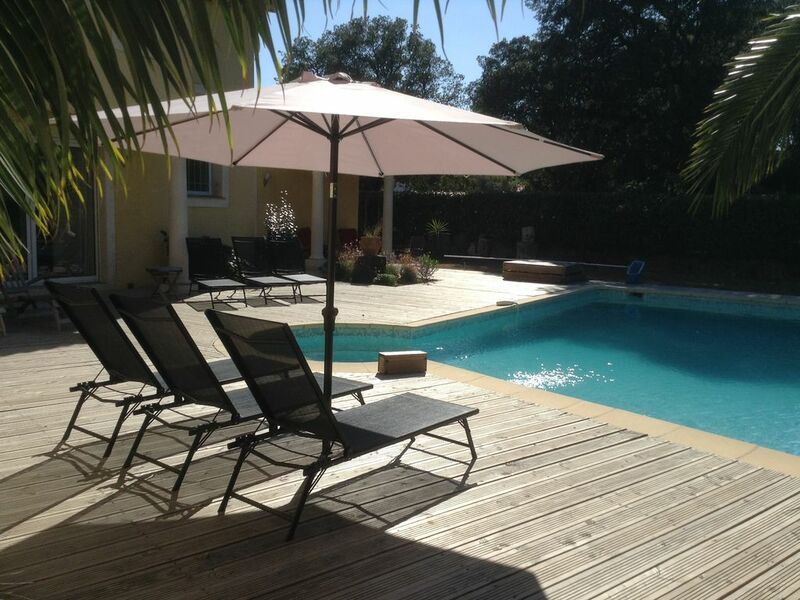 It is situated in a small private domain, only 800metres from Grimaud beach. Access to the domain is through coded electric gates. It is a quiet area with open views. Nearby, there are tennis courts, a golf course, and a bowling alley. Ground floor: lounge/kitchen diner with table and chairs for six. Washing machine, dish washer, small oven, vitro ceramic top, microwave and fridge/freezer. Flat screen TV / 2 setties. Private outside: Shaded dining terrace/patio with gas barbecue and table and chairs for 6. Upstairs 3 bedrooms 2 bathrooms. The main bedroom has an ensuite bathroom with wash basin, shower, and wc. The other 2 bedrooms share the second bathroom with wash basin, shower and wc. There is air conditioning throughout but if you prefer there is also a ceiling fan in the lounge area. It is situated in an exclusive area near Port Grimaud in the Gulf of Saint Tropez, a brief walk to the beach and only a short drive to local amenities. Very conveniently situated, it is only 8km (4,5 miles) to St.Tropez, 6km(3,5 miles) to Ste Maxime, 1.5km(0,6miles) to Port Grimaud and 6km (3.5miles) to the beautiful village of Grimaud. It is also a walking distance to the beach and to the largest and most beautiful Hotel de plein air which offers many restaurants and shops. Our guests are completely independant. My husband and I are there to help if you require any advice or information. You are welcome to share our swimming pool with its wide deck and loungers for everybody. There is space to park your car just by your patio. Bathroom 1: wash basin, shower, wc. Bathroom 2: wash basin, shower, wc. Air conditioning units are reversible and can therefore provide heating. Private outdoor patio with table and chairs for 6. The pool is shared with the owners . There are plenty of local activies available, which include sailing, snorkling, bowling, golf, crazy golf, water parks, tennis, theme parks and restaurants. Also easy access to the various beaches of Grimaud, Port Grimaud , Ste Maxime and St Tropez. Colourful provençal markets are all around on different days of the week, and one can also meander around the hilltop villages such as Grimaud, Gassin and Ramatuelle.